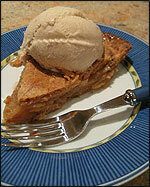 February 2012: Dental Crowns, "Money Matters" & Hot Apple Pie! While we know that oral health is related to overall health, a study in the Journal of Periodontology suggests that oral health might be more closely related to the health of your heart than you may think. Links have been found between periodontal disease and Stroke as well as Heart Diseases. Over simplified, the bacteria found in the mouths of patients with Periodontal disease may enter the bloodstream through the inflamed gum tissues. This bacterium then travels though the body, contributing to clot formations, swelling of the arteries and other factors that lead to heart complications. All Elementary/Secondary Public and Catholic schools in Toronto have a PA Day. Contact our office to schedule the kids in. It's your last chance before March Break! Click here for other Holidays and PA days to remember. Win a Dinner and a Movie Made Easy! Here's a great way to spend your Valentine's Day with someone special! All you need to do to be entered into our monthly draw is to LIKE our FACEBOOK, Add us on LINKEDIN and/or follow us on TWITTER and you will be entered in a draw to win a Dinner and a Movie Made Easy! The Winner to be featured on the March 2012 Newsletter, Facebook and Twitter... Enter Today!!!! January Social Networking Contest Winner! Congratulations Cynthia! Please contact our office to claim your prize. Dr.Nick - Movie Review - Mission Impossible 4 - The IMF is shut down when it's implicated in the bombing of the Kremlin, causing Ethan Hunt and his new team to go rogue to clear their organization's name. A fantastic action packed thriller! The hotel climbing scene was the best! Dorothy's Movie Review - The Help Written and Directed by Tate Taylor. Screenplay by Kathryn Stockett. An aspiring author during the civil rights movement of the 1960's decides to write a book detailing the African - American maid's point of view on the white families for which they work for, and the hardships they go through on a daily basis. This certainly was a very powerful, entertaining and touching film, I bawled my eyes out! Frieda's Children's Book Review - The Poky Little Puppy - Author:Janette Sebring Lowrey The sweetest little book I've read to my little boy. It's a cute story! My son keeps asking me to read it over and over again. Lisa's Pick on a Health Club Membership -I have been going to the Columbus Centre Health Club and I absolutely love it. Two thumbs up. Excellent facility and wonderful staff! Tanya's Movie Review - We need to Talk about Kevin Written, Directed Lynne Ramsay - This movie is about the mother of a teenage boy who went on a high-school killing spree tries to deal with her grief - and feelings of responsibility for her child's actions. This was one of the most disturbing movies I've seen to date . I highly recommend it, however be warned its not a "feel good" type of movie. Crack! Was That your Tooth? Time to call Dr. Nick Babatsikos! Ben Bernanke, U.S. Federal Reserve Chairman recently announced that the American benchmark interest rate would stay low until at least late 2014. Here in Canada, the Bank of Canada Governor Mark Carney highlighted that our economy continues to show resilience. Predicting modest growth for this year, he points to 2 per cent inflation as the economic speed limit. It is likely that Mr. Carney will not make an interest rate adjustment unless inflation becomes an issue. As global economies work to achieve stability, the low rate policies of Canada and the U.S. should maintain mortgage rate stability for the next 12 to 18 months, unless Bond Rates begin to shift. More on that next time. Please feel free to contact me for further insight.